Called Smart Reply, it lets users tap on one of its suggested responses to start editing. “For those emails that only need a quick response, it can take care of the thinking and save precious time spent typing. And for those emails that require a bit more thought, it gives you a jump start so you can respond right away,” wrote Bálint Miklós, a software engineer at Gmail. Gmail’s Smart Reply feature does this by harnessing Google’s artificial intelligence software to interpret an email and craft three different responses. 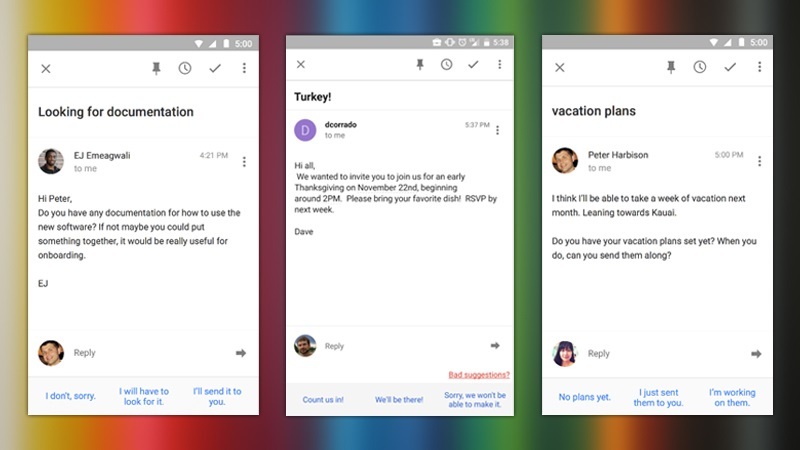 Google said the feature would be available on the English language version of its Inbox by Gmail app for Android and iOS later this week, although there’s no word yet on integrating the feature in the web-based version of Gmail. While the replies may seem simple, a post from Greg Corrado, a senior research scientist at Google, explained how the software applies the machine learning tools that Google is using across many of its services to understand and form natural language sentences. Smart Reply is built on two artificial “neural networks” – software that in some ways mimics the structure of the human brain – that Google has “trained” to understand natural language. Rather than having Google engineers craft rules on how to reply to emails, a neural network can “learn” by scanning the contents of thousands of emails. Smart Reply employs two neural networks: one to interpret the meaning of an incoming email and another to form a reply. “These systems generalise better, and handle completely new inputs more gracefully than brittle, rule-based systems ever could,” Corrado wrote. He said that early tests of the software had offered sets of responses that were very similar to each other, so Smart Reply had to be calibrated to provide responses with different “semantic intents”. Google said another quirk was that the software would often suggest “I love you” in its replies since, naturally, the phrase features in a certain number of emails, but that testing had removed this from the consumer release.